As we said – in the very first sentence – in the first part of this series, the one true rule of pairing food and wine is that such pairings are highly personal. The ethnic/cultural background and, specifically, the food one grew up with are influential on how taste is perceived by the individual. Someone who eats mostly spicy food will taste wine very differently from someone accustomed to more bland foods.. When you enter the differences of each individual’s taste buds into the equation you can understand that what may be a perfect pairing for one person, may not necessarily be so great to another. Rules are, at best, approximations based on the “average” person (read: “the average connoissseur,” often self-proclaimed, instead). I could find no scientific study ever conducted that definitely showed what is the “average” when it comes to taste matters. What is the point of this series, then, if the rules are subject to each individual’s preferences? That is a fair question! The answer is that all we intend to accomplish – here – is to give you, gentle reader, some departure points as you embark on your very own food and wine pairing journey. Just remember that wine should never overpower the food it accompanies but it should complement it. 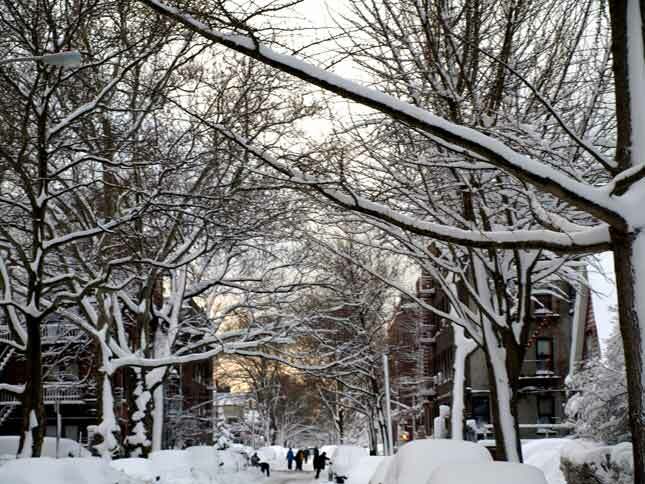 Once again, winter has shown itself relentless and bombarded us with another big snowfall. Considering that wine can warm the soul and gladden the heart, considering that medical most studies now find the health benefits in drinking 2 daily glasses of wine (like the French do), isn’t this weather just right for sipping wine, especially if paired with a nice soup? How about a Chicken Noodle Soup, paired with a Pinot Grigio or a Chennin Blanc? Perhaps a Cream of Chicken Soup with a Sauvignon Blanc or a Viognier would fit your preference? Maybe a French Onion Soup paired with a Beaujolais or a White Burgundy? Hmmmmnnn, my mouth is watering already! Pinot Noir – Yes, it’s a red wine, but try it with grilled fish and see what it does! Pizza – Chianti is the perfect choice! This does not pretend to be an exhaustive list, it merely reflects pairings I’ve tried and liked. Example: A light-bodied fish like sole works best with a light-bodied white wine like pinot grigio, while a heavier-bodied fish like salmon calls for a richer, fuller-bodied white like chardonnay. Example: A mildly flavored food like roast turkey pairs well with light-bodied white and red wines like sauvignon blanc and Beaujolais, but in the context of a Thanksgiving dinner featuring stuffing, cranberry sauce, and other strongly flavored side dishes, an intensely flavored white like gewürztraminer or a rich, fruity red like syrah or zinfandel would be preferable. The five basic tastes are sweet, sour, salt, bitter and umami (the recently discovered fifth taste found in savory foods like mushrooms, tomatoes, soy sauce, and aged cheeses and meats). Salty and sour tastes in food make wines taste milder (fruitier and less acidic), while sweet and savory (umami) tastes make wines taste stronger (drier and more astringent). 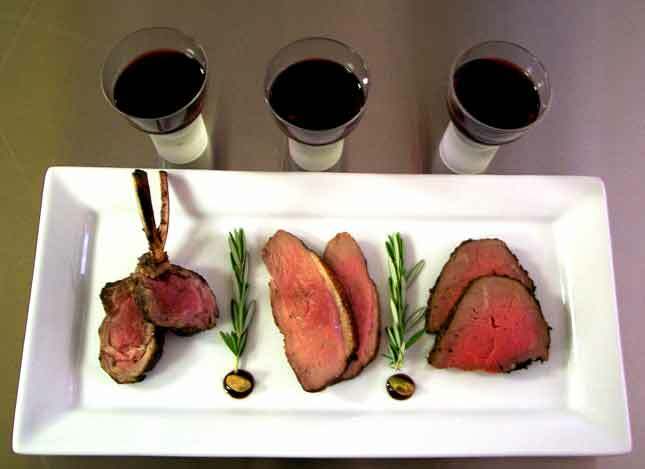 Example: A simple cut of beef tames the tannins and brings out the fruit of a young cabernet sauvignon, but chocolate (which some people enjoy with cabernet) will accentuate its tannins and diminish its fruit. Seasonings, such as salt, lemon, vinegar, and mustard, can be used to achieve balance in food-wine pairings, either to make the wine taste milder (salt, lemon, vinegar) or stronger (sugar or umami ingredients). Flavors are combinations of tastes and aromas, and there are an infinite number of them. 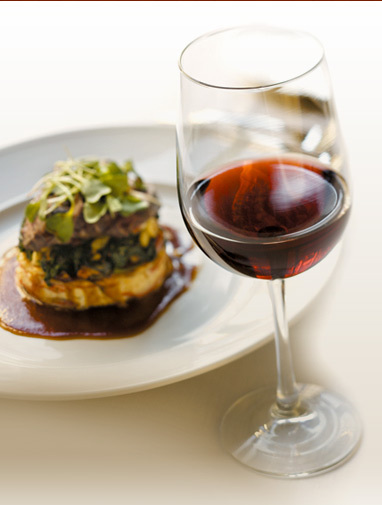 You can fine-tune food and wine pairings by matching flavors in the food and the wine. Example: Roast duck in a plum sauce is well-served by red wines, like barbera or syrah, with pronounced black plum flavors while grilled steak in a pepper sauce will go beautifully with a peppery zinfandel. Sometimes, the best choice is to counterpoint flavors rather than matching them. Example: Pairing a spicy dish like Jamaican Jerk Chicken with a high-alcohol red wine may seem logical, but, in fact, the heat in the dish will ignite the alcohol in the wine to produce an unpleasantly hot, harsh impression. A better choice is a low-alcohol, fruity wine like riesling or gewürztraminer, which will both frame and tame the spicy flavors of the dish. Enjoy your pairings, gentle reader, enjoy! What’s the best glassware to enjoy your wine in? Whether you buy a $125.00 Riedel Bordeaux Wine Glass at Nieman Marcus or a set of 4 Libbey Vina Red Wine Glasses – $15.49 for the whole, at Target – there are certain rules worth observing to maximize the enjoyment of a fine wine. Always get clear glass – Although crystal is preferred, it is expensive and only serious wine connoisseurs can justify the expense. Why clear glass? Seeing the color of the wine, unadulterated by any materials or colors from the glass is an important part of enjoying the particular potable. Besides, the wine color tells how old the wine is, what grape(s) it’s made of and more. The glass should be large enough to release the bouquet – Never fill the glass more than half way, this allows the top of the glass to capture the bouquet or aroma of the wine as you give it a swirl. A quality wine glass tapers at the top. The bolder the wine the bigger the bowl the glass should have. A delicate wine requires a smaller bowl to bring out its best features. Always get a stemmed glass – This avoids your body temperature warming the wine, since you are holding the glass by the stem rather than by the bowl. 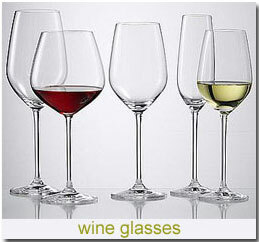 Riedel was the first company to introduce different size glasses to suit each wine type enhancing bouquet color and other fine qualities of the particular wine; many other companies, in almost every price range, followed. Not even the most fervent cognoscente will need every shape, but two or three types, especially when you know what suits which type of wine would add to the wine tasting experience. 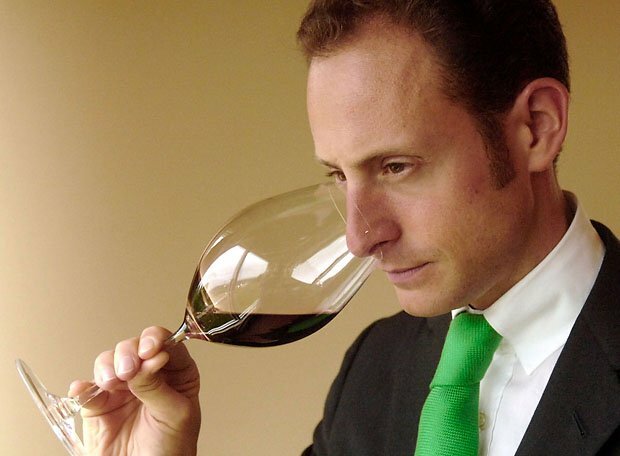 Glassware used for a Pinot Noir or Red Burgundy are the widest and resemble a sniffer. These glasses direct the aroma to the nose while allowing ample room for the wine to air out. It’s really quite remarkable how wine that is allowed to air out (even for a few minutes) tastes different and far better than a wine that was poured and tasted seconds after. Glasses for full bodied Bordeaux and other red wines are slightly narrower and less round, but still tapered on top. Chardonnays and White Burgundy are best enjoyed in midrange bowls and are even less rounded. Ideal glasses for Sauvignon Blanc wines are smaller yet, but have a wide bowl to fully show off the flavors and aromas of these wine types. Champagne (or any sparkling wine) is best enjoyed in a tall, narrow “flute.” This shape minimizes warming while letting you see the bubbles in the most attractive manner. Non fortified dessert wines require smaller glasses, but are still rounded. Even smaller are Port glasses, which are also used for all fortified dessert wines, they show off the color while directing the bouquet to the nose through the relatively narrow top. While technically unnecessary, the Sherry glass has a more square bowl, it is smaller than a Port glass and very attractive. Now that you have a nice collection of wine glasses, how do you care for them? Wash between uses, some experts advise washing only with hot water, while others suggest hot water with dish detergent as long as the glass is rinsed thoroughly to be free of all detergent remainder. Even a smallest amount of lemon or other such scented detergent can ruin the nose of any wine. When done, always hold up the glasses to the light to make sure they are clean. A superficially clean glass may be covered with a very fine scum which is very difficult to remove with a gentle rinsing. Such residue will adversely affect the wine especially if it is a champagne or other sparkling types, as they won’t show their fizz. Once washed let the glasses drip dry, when dry polish them to remove any unsightly water marks. Store them upright in an odor free cupboard. Last evening, the Israel Wine Lovers Club hosted an evening of white wines. The wines were made from three types of grapes: Chardonnay, Sauvignon Blanc and Viognier. It’s been said that if Chardonnay didn’t exist it would have to be invented. No other grape, red or white, ever achieved international recognition as effectively as this grape. It possess chameleon like adaptability to almost any climate and terroir. Compared to the rest of its sisters, this grape is a cinch to grow and thrives at both climate extremes of the viticultural spectrum (and in-between! ), but unlike so many other grapes it is also very easy to work with at the winery. It’s harvested in almost every wine producing country. If unoaked its taste will remind you of a tart apple, lemon and even pears. When lightly oaked, it brings out the tastes of melting butter, baked apple, nutmeg, oatmeal. When heavily oaked one can taste vanilla, lemon curd, chocolate or woodsmoke. After Chardonnay, Sauvignon Blanc is the world’s most popular white grape. Unlike Chardonnay, which barely has any aroma, Sauvignon Blanc has a very distinctive strong aroma. It’s wine is paler and somewhat light but acidic. One can detect almost any fruit in this wine’s flavors, from sour greens to melon, passion fruit or mango. It often has a very definite black currant hint. It also can bring to the fore vegetable flavors like green peas, asparagus and – occasionally – sweet red peppers. Other times it brings out far more earthy flavors. At times it even shows a faint smokiness. Viognier is a relatively new grape in the international market, the average consumer may never have heard of it before the early 1990s. It’s often been blended with Chardonnay, but more and more are we starting to see it stand out on its own. It is a great alternative to Chardonnay, with a nice pleasant aroma. Its most obvious flavor is apricot in all its range, you may also detect faint notes of cinnamon, cardamon and ginger. At times it may resemble a honey-lemon lozenger. Raffi Sutton who used to write for Globes (Israel’s equivalent of our Wall Street Journal) on Israeli wines and later was the editor of an Israeli food and wine magazine, before becoming an investment banker in the US, did the wine presentations. He was ably aided by Avi Ashman – the Club’s President and founder – and Eran Elhalal, a graduate of the presitigious Culinary Institute of America, chef and consultant whose recipes and wine pairings have already graced our pages. The tasting started with a 2009 Dalton Unoaked Chardonnay. This wine was fermented without any barrel influence and aged over the deposits of dead yeast that forms after fermentation. This Unoaked Chardonnay is fruity wine with well-balanced acidity, bursting with citrus and tropical fruit flavours. This particular aging process is known as “sur lie,” greatly enhances the complexity and flavor of the wine. We continued with a 2007 Binyamina Unoaked Chardonnay. Light golden straw in color, a simple wine showing some citrus and tropical fruits but lacks the crisp minerality one hopes for in an unoaked Chardonnay. Unfortunately I found it past its prime. The third wine of the evening was the 2007 Domaine du Castel C (Chardonnay) Blanc du Castel. Full-bodied, elegant Burgundy style white, showing citrus, pineapple, green apple, toasted bread and fig aromas. While quite promising this wine was certainly “before its time.” It hasn’t fully matured and the chardonnay flavors were still battling with the alcohol which hadn’t fully blended in. Yet, this white wine was robust enough to be consumed with almost any red meat, thus destroying the myth that white wines should only be paired with fish or delicate white meats. Next came the 2006 Tishbi Special Reserve Chardonnay. Very fruity, lighter, citrus. it’s a full bodied dry white wine is made grapes grown in the Gush Etzyon vineyards and harvested by hand. This chardonnay carries the exotic aromas of apricot, melon and peaches. Though considerably cheaper than its predecessor I liked it far better! That fourth selection was followed by 2007 Yarden Odem Chardonnay. Made entirely from Chardonnay grapes grown on the Golan Heights Odem organic vineyads. Barrel fermentation and sur lie for seven months, produced a complex wine balancing fruit and floral notes with hints of butter and vanilla. Chef Eran suggested an unusual pairing for it… Café Brulé! The sixth selection was the 2008 Recanati Sauvignon Blanc. With Fresh hay and bell pepper notes, typical of fine Sauvignon Blanc, develop and linger in the bouquet. It had an initial bite almost like a sparkling wine. Outstanding when paired with fish, sushi, risotto and grilled vegetables. Next came a 2009 Tabor Chalk Sauvignon Blanc. Citrusy, pleasant and light, with a bitter aftertaste. It wotld make a great selection for a hot summer day. The eighth selection was the 2007 Galil Mountain Viognier. It displayed a clear lemon yellow color. The wine is extremely aromatic with flavors of ripe apricot and nectarine set against hint of oak and honey. Well balanced with delicate acidity, medium body and a long, velvety finish. The last wine was the 2008 Dalton Reserve Viognier. It starts with a certain smokiness, showing intense, vibrant and complex with spice, floral, fig and melon aromas and flavors. Deep and rich with a long, broad finish. Chef Eran suggested pairing it with desserts that are not too sweet. This wine is by far much better than its price range would suggest! The participants, enjoyed an evening of Chef Eran’s selections of sharp kosher cheeses by Danablue, Gilboa, Shahat, marmalades and grapes. The conversation was great, well worth many a repeat visit. Announcing a new Meetup for Israeli Wine Lovers! All our tastings started with white wines and generally ended with reds. Now its time to give Kosher Israeli white wines ALL the attention they deserve…. Come and explore crisp Chardonnays, lively Sauvignon Blancs, refreshing Viogniers as well as other wonderful blends…. Sit back and relax and join other wine lovers at the Israeli Wine of the Month Club’s interactive wine tasting experience. What is interactive wine tasting? * Nine wonderful Israeli wine will be explored. Artisan cheeses and breads, crackers and fruit are also served. Where? Quint, Miller & Co.
We’d love it if you mentioned The Kosher Scene as the blog where you first heard about it. There are literally thousands of grape varieties in existence. Most wine grapes are made from the European species, which is considered to be superior to the American vine species. The reason for the numerous varieties is that grape vines have a tendency to mutate and cross breed with ease. Advances in genetic technology have allowed scientists to determine the origins of many well-known grape varieties. The following will give you an introduction to the world of most common grape varieties. Cabernet Sauvignon requires care and attention in the vineyard, with fruit exposure and yield directly related to fruit quality. However its thick skin makes it incredibly resilient to adverse climatic conditions. In the winery, winemakers often age Cabernet Sauvignon in a mixture of French and American oak. Climate has a significant impact on the sensory characteristics of the variety. In cooler climates, minty and leafy characters are intermingled with blackcurrant and red berries. In warmer climates, chocolate and tobacco characters express themselves. Cabernet Franc is a component of Bordeaux blends and Loire Valley reds. It has leafy red-berry characters. Malbec is a successful varietal in Argentina. Also used in Bordeaux blends. For Merlot to be good, it must be picked at optimum ripeness, to avoid the presence of herbal characters. Flavors of plums, red currant, mint, pimento, game, earth and leather can be found. Its tannins are invariably soft, making Merlot a good early drinking style, but this does limit its aging potential. Merlot is most famous in its homeland of Bordeaux in France, where it is used to make some of the world’s greatest and most expensive wines. Over the last ten years, plantings have rapidly expanded across the globe, most notably into California, South America, Italy, South Africa, New Zealand and Australia. Petit Verdot is a red grape variety that is traditionally used in Cabernet Sauvignon based blends. It is known for its intense color, vibrant flavors and firm tannin structure making it a good choice for true red wine drinkers. Petit Verdot has an interesting flavor profile. It can be incredibly perfumed, having aromas of blueberry and violet. Sometimes it has an attractive herbaceous and spice element, giving the variety complexity. The acidity is often prominent and due to the thick skins of the grape, the color is very dense and the tannins are firm. Structural wines with intense flavors can age well in the mid term. Due to its strength of character, Petit Verdot can have a significant impact on a blend, even when used in small proportions. Pinot Noir originated in the French region of Burgundy, where it is most renowned and revered. The true character of Pinot Noir is expressed when it is grown in a cool climate. In fact, its early ripening nature makes it able to withstand some of the cooler areas. 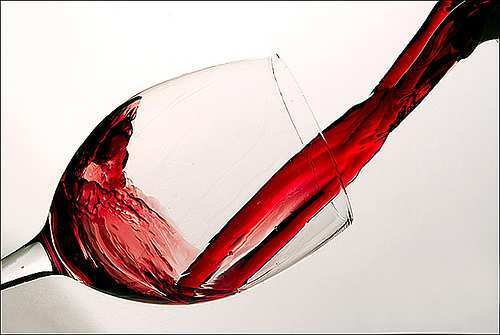 Wines made from Pinot Noir are typically lightly colored, with cherry-to-plum red hues. The aroma, which is often highly fragrant, can be composed of cherries, red berries, violets and spice when young, transforming into gamey, leathery, mushroomy characters with age. The palate is light-to-medium bodied with fine silky tannins. As complexity is a vital attribute of good Pinot Noir, the winemaking process is very detailed. Some winemakers choose to include whole berries in the fermentation to increase the fragrance of the wine. Others allow crushed grapes to macerate prior to fermentation to increase the depth of color and flavor. Some choose to do this after fermentation. Oak is used as an important element in both the sensory and structural aspects of the wine, however due to the delicacy of the variety, care must be taken to ensure that it doesn’t dominate the wine. It is not unusual for a single batch of grapes to be processed in different ways to give a range of blending options for the final wine. The beauty of Syrah is that it can flourish in a range of climates. Syrah can be made into a range of styles, defined by the terroir of the region and the winemakers’ artistry. With its soft ripe tannins, black cherry, pepper and spice characters, it can be crafted into wines suitable for immediate consumption. Substantial plantings in both California as well as Italy. In Italy it is known as Primitivo. It produces full-bodied and richly flavored wines. The popularity of Chardonnay quickly rose, due to its generous flavors and its ease to grow and make into wine. In fact, it is often called a viticulturalist’s dream, as it is early ripening, naturally vigorous and is relatively resistant to disease. Most importantly, it can be grown in a wide range of climatic conditions, leading to a vast array of styles. The base flavor of Chardonnay is generous, but relatively neutral thus the winemakers’ individuality can be expressed through the winemaking techniques used. Oak usage, yeast lees contact and malolactic fermentation are just some of the ways a winemaker can influence the style of Chardonnay. Chenin Blanc is a classic French variety. The basis of some of the world’s greatest and long-living sweet wines. Gewurztraminer is a spicy, aromatic variety. Its style ranges from the flavorsome and fruity, to fine and delicate. There are many synonyms for Pinot Gris. In Alsace, it is known at Tokay Pinot Gris. 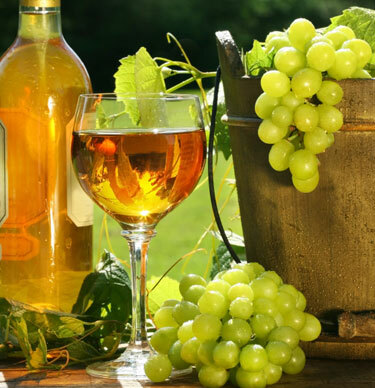 In Italy, it is commonly referred to as Pinot Grigio and in Germany it is known as Ruländer or Grauburgunder. Gris, meaning grey in French, refers to the color of the Pinot Gris grapes. As a result, wines made from Pinot Gris often have a slight coppery hue. They have a delicately perfumed aroma with flavors stretching from fresh pear through to tropical fruits. Pinot Gris is similar to Chardonnay in that it has good palate weight and flavor. Riesling is an aromatic variety that produces intensely fragrant and flavored wines of exceptional character. Notes of citrus, honeysuckle, blossoms, green apple and mineral are commonly seen. With concurrent high acidity and comparable low alcohol, the wines retain an enviable freshness which many other varieties lack. Oak is not used and the wines are very pure and clean. Riesling is a variety that is much loved by winemakers and wine connoisseurs due to its intense flavors and its defined palate structure. Riesling is delightful when it is consumed young and fresh. However it is one of the few white wines that has the ability to age. Sauvignon Blanc is a variety with increasing popularity in Australia. Although its plantings are quite small, they are expected to significantly increase over the next ten years. Sauvignon Blanc is used to make fresh, vibrant wine styles with none of the heaviness of Chardonnay or the floral tones of Riesling. Its flavor profile is in harmony with Semillon and consequently these varieties are often blended together. The flavor spectrum of Sauvignon Blanc is quite diverse. Upon a backbone of herbaceousness lie tropical fruit, passion fruit and gooseberry. Look a little closer and you may see tomato leaf, spice and flint. The stronger styles have elements of asparagus, capsicum and gun smoke. And winemaking can add tones of oak, butter and yeast. They are a feast for the senses, especially during the heat of summer where their defined acidity adds freshness to the palate. Semillon is a unique minerally, lemony style, which is crisp and lean when young and is made without the influence of oak or malolactic fermentation. However the wine undergoes a transformation with age, evolving into a complex, nutty, honeyed wine of great depth and complexity. Semillon is often seen blended with Chardonnay, particularly in mass-market wine styles. The freshness of Semillon provides a necessary balance to the often overly rich Chardonnay. It is a blend that has been very successful. The most distinctive attribute of Viognier is its stone fruit character, most notably that of apricot. It can also show considerable floral and spice tones. In cooler climates you can see citrus whilst in warmer areas there is more honeysuckle. It has good viscosity due to generous alcohol levels and is similar to Chardonnay in that it has a weighty mid-palate and generous flavour, making it a good alternative to this ubiquitous variety.